Constructed from 4130 Chromoly and high strength steel (optional 7050 T-74 aluminum construction), the ROAM JL Bike Carrier Rear Bumper improves the rear departure angle while integrating a bike carrier, a full size tire carrier (compatible with 40″ tires), a Class IV trailer hitch (2″ receiver) and heavy duty undermounted 1/2″ recovery points. The integrated bike carrier folds up and out of the way when not in use and is rated for offroad travel; keeps your bike securely attached over rough and harsh terrain. Rated for up to 100 lbs per bike and XXL frame size compatible. All contact points are carbon and paint safe: the touch points (bike frame) are rubber coated composite with replaceable silicone pads. 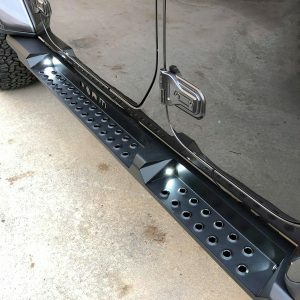 Laser cut and fully seam welded for ultimate strength and protection, the ROAM JL Tire Carrier Rear Bumper is 2 stage textured poly powdercoated for surface durability. No drilling, cutting, or welding is required for installation. Center Brake Light and Camera Relocation bracket included. License Plate mount included. Exceeds all OE specifications for resistance to the elements. Made with pride in the U.S.ofA. Add $200 for optional 7050 T-74 aluminum construction. Add $400 for optional 316 stainless steel construction. 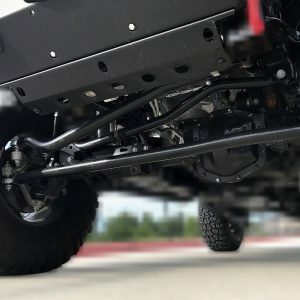 Add $100 for Line-X instead of powdercoat or add $200 for Line-X Premium or add $250 for Line-X Platinum (this option replaces the included 2 stage powdercoat finish with Line-X instead, adds about 6 weeks lead time).